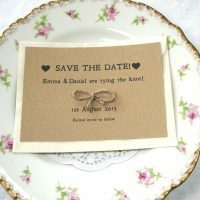 Categories: Vintage, Unique & Eco-Friendly Wedding Stationery, Save the Date. Very pretty recycled seed packet to remind people to save the date – your very important wedding date! The seeds are wild Field Forget-me-not seeds. 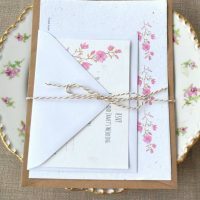 The seed packet is made from 100% recycled manilla paper and measures 9 x 12 cm. 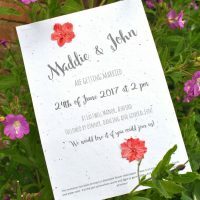 Please advise the personalisation details in the box above that you would like printed on the packets. The Forget-me-not seeds are of the wild Field Forget-me-not variety (myosotis arvensis). Comes with a recycled envelope. You will get approximately 200 or so seeds per packet. Forget-me-nots are best sown in the Autumn so that they flower the following spring. They produce masses of tiny, delicate blue flowers with yellow centres. Once you have them they will self-seed all over the garden! The plant’s Latin name – myosotis – derives from the Latin for mouse ear, which the leaves tend to resemble. Forget-me-nots have been around since the late 1300’s when Henry IV took the plant as his emblem. It was known as Scorpion Grass, according to the herbalist Gerard (1633), because its flowerhead was thought to resemble a scorpion’s tail. Therefore it was also believed to cure the sting of a scorpion, and snake and dog bites. In days of old, blacksmiths kept a bunch of Forget-me-nots in their forge to protect horses from injury. 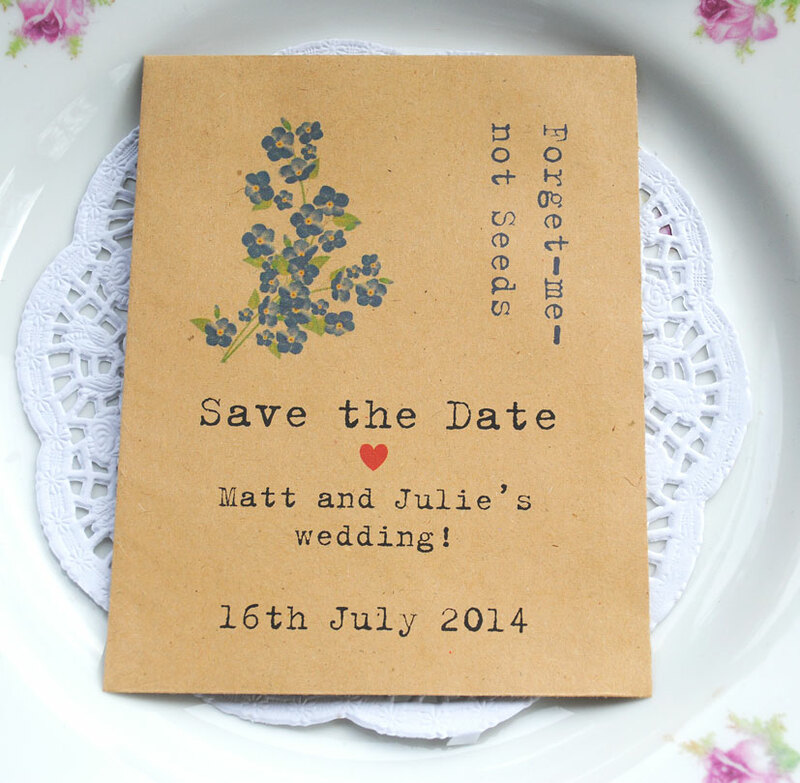 In the language of flowers, Forget-me-nots are symbolic of true love. Forget-me-not seeds are best sown in autumn so that they are ready enough and big enough to flower the following spring – the seeds are viable for a few years so no urgency! Find a bare patch of soil int he garden in a sunny spot and sprinkle on the seeds. Press them gently into the soil and then water. Alternatively you can sow them in a tray of compost in the same way and, once big enough to handle, carefully remove the seedlings and plant them in a small pot each and grow on until ready to plant out in the spring.